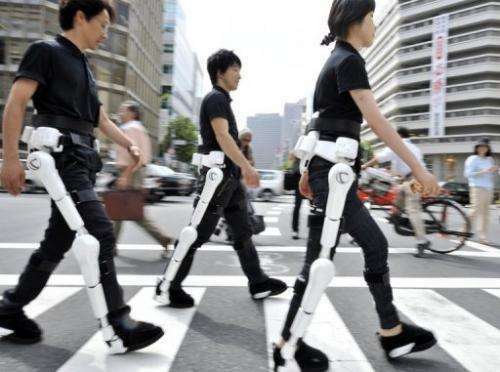 Japanese robotic scientists wear the Hybrid Assistive Limb (HAL) during a demonstration on the streets of Tokyo in 2009. A disabled Japanese man has embarked on an ambitious trip that will take him to a mediaeval French World Heritage site with the help of a cutting-edge robotic suit. "Right now, I cannot stand on my own feet without help," said Uchida at Tokyo's Narita airport before his departure to France. "But I will never give up on my hope of someday walking on my own feet, no matter how many years it would take." In a project planned to take place Tuesday, Uchida -- paralysed from his waist down and in one hand -- will be carried up the hill of Mont Saint Michel by a man wearing a robot suit, called the Hybrid Assistive Limb (HAL). Battery-powered HAL, which detects muscle impulses to anticipate and support the user's body movements, was originally designed to help the elderly with mobility and manual work and to assist hospital carers in lifting patients. 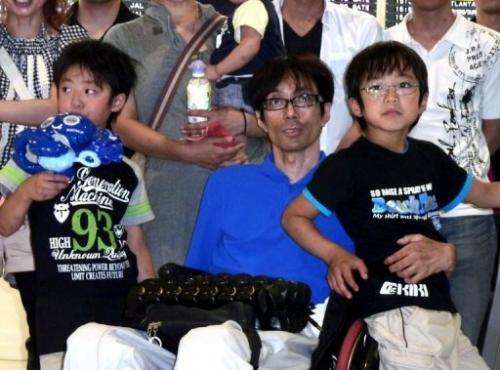 Wheelchair-bound Seiji Uchida (centre) holds his children as he heads to France for his mission to climb Mont Saint Michel -- a rocky islet in Normandy. Seiji has embarked on an ambitious trip that will take him to a mediaeval French World Heritage site with the help of a cutting-edge robotic suit. The specially-designed exoskeleton suit will enable Uchida's carrier to bear an 80 kilogramme (176 pound) load, whereas Uchida only weighs 45 kilogrammes. The suit, which works like an exoskeleton and amplifies the muscle power of its wearer's legs, has a pannier that Uchida will hold onto. A full-body model of HAL, being developed by Tsukuba University professor Yoshiyuki Sankai, assists both arms and legs, and allows users to carry a load of up to 70 kilogrammes (154 pounds) with one arm. Uchida and a support team used an earlier version of the suit in an unsuccessful attempt to conquer the 4,164-metre (13,661-foot) Breithorn peak in Switzerland in 2006, when climbers wearing the robo-suits carried Uchida. Uchida said he wants to visit the rocky tidal island of Mont Saint Michel, where a steep and narrow trail leads to an abbey and former fortress, to "prove that it is possible for disabled people to visit the world's historic sites without relying on facilities like elevators", he said. I'm beginning to think the anime Roujin Z was prophetic. not only could these tpye of suits help those man walk, it could give us more strength. @kaasinees; the suit isn't helping the man walk (hopefully one day), and it IS giving the porter more strength (which is the premise behind the article). There is somewhat of a contradiction there. It says he has lost the ability to walk, and then it says that he can stand, requiring assistance. Hopefully, someday it'll help people with spinal injuries, paralysis, or even those with Cerebral palsy. @FroShow I'm sorry to hear about your friend. That's such a terrible thing to happen to someone. And it's such a pity as well. :( I take back the assumptions I made earlier, as I couldn't imagine what it would be like in this guy's position. Something like this will help my son who is disabled from a hit and run driver many years ago.....has hemiplagia. He has the nerve impulses but his muscles have ataxia, and he has hemiplagia on the left side. He can walk with a fore-arm crutch with my assistance for balance for short distances. I think he has the basics to use it although some kind of 'spurious impulse' filter would have to be in place because of the motor ataxia.